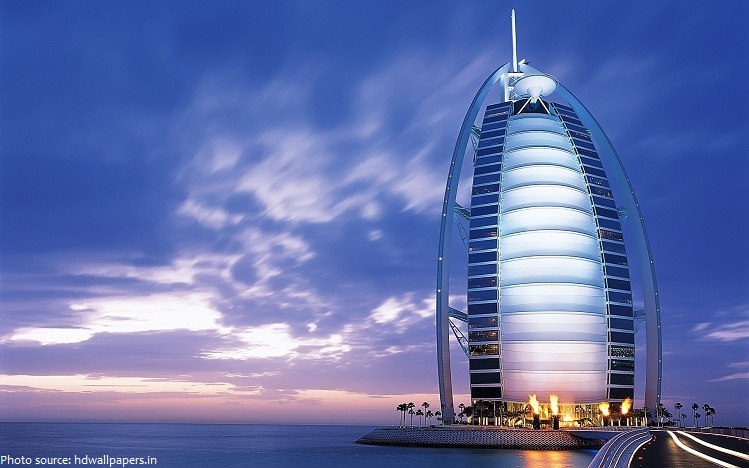 The Burj Al Arab is a hotel located in Dubai, United Arab Emirates. At 321 meters (1,053 feet) it is the third tallest hotel in the world (not including buildings with mixed use); however, 39% of its total height is made up of non-occupiable space. 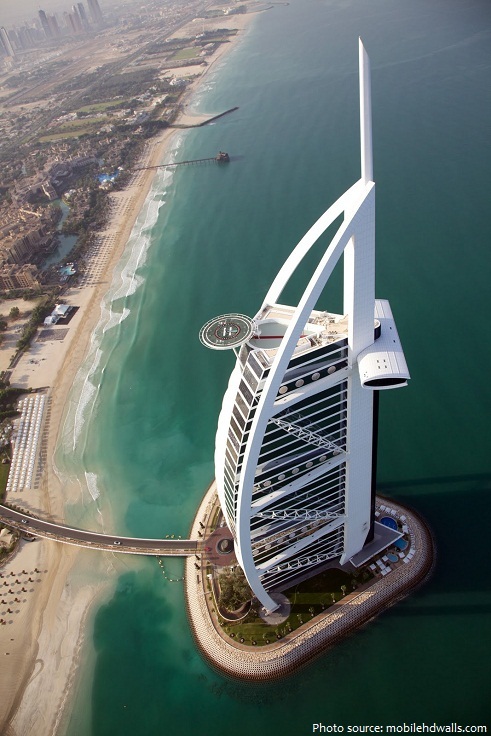 Burj Al Arab stands on an artificial island 280 meters (920 feet) from Jumeirah beach and is connected to the mainland by a private curving bridge. The shape of the structure is designed to mimic the sail of a ship. 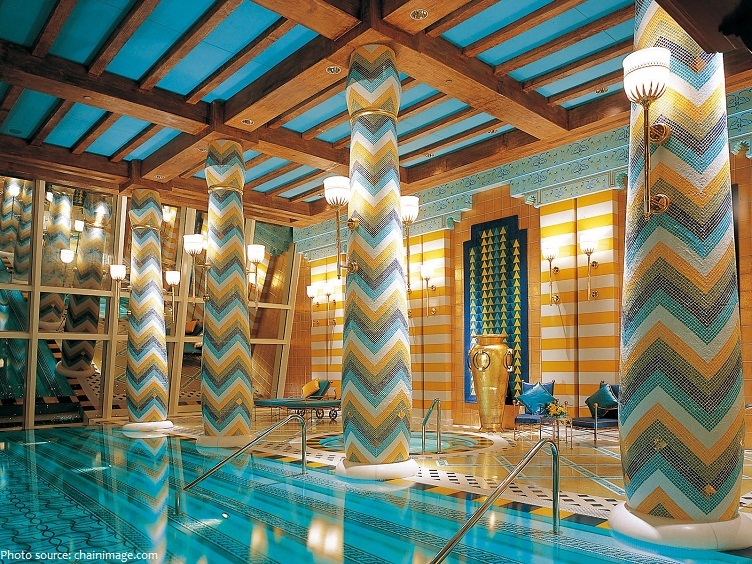 The Burj Al Arab is one of the most luxurious hotels to stay in. It has been called “The World’s Only 7 Star Hotel”. In 1993, architect Tom Wright of WS Atkins took on the challenge of creating this groundbreaking superstructure. 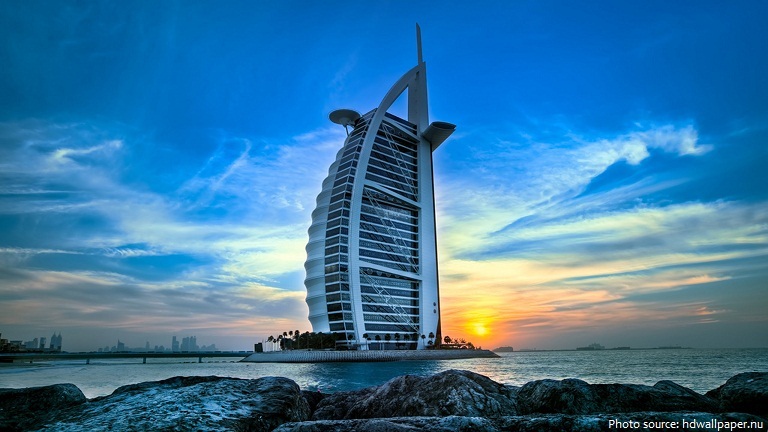 From the very beginning Burj Al Arab was planned and designed to become the icon of Dubai. Construction began in 1994 and involved 3000 companies and contractors; 250 designers from the UK, USA and Dubai; and 3500 workmen on site at any given time. It took two years to reclaim the island in the shore waters of the Arabian Gulf, and a further three years to erect the magnificent landmark. 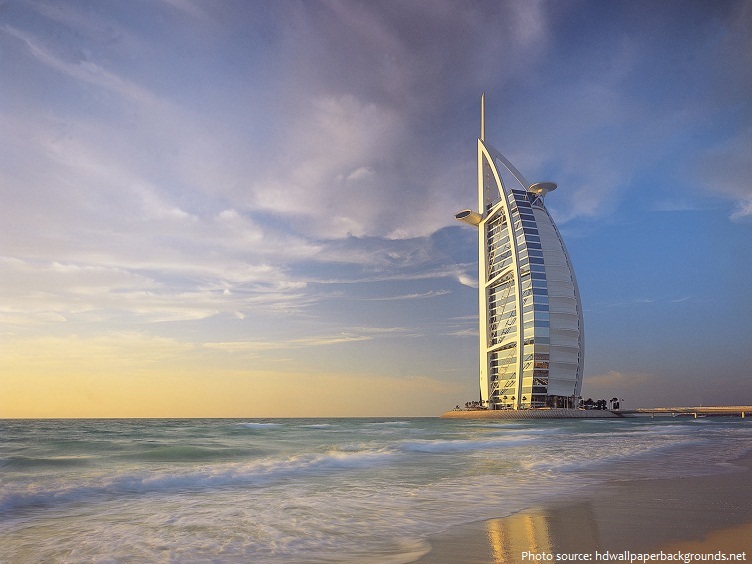 Burj Al Arab’s doors officially opened on 1 December 1999. An incredible 70,000 cubic meters (2,472,026 cubic feet) of concrete and more than 9,000 tonnes (9.920 US tons) of steel were employed in the construction of the tower. 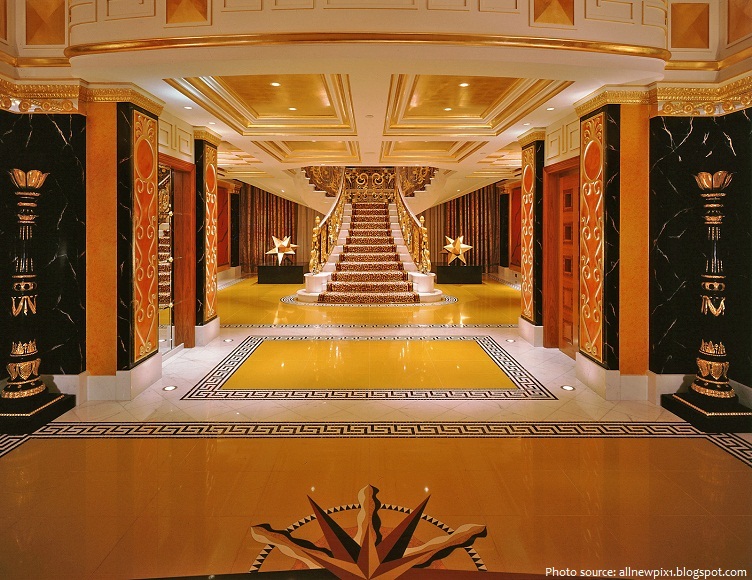 The finest and most exclusive materials were sourced for finishing the interiors of Burj Al Arab. Amongst the fine items brought in to create the magical interiors were custom-made carpets and rugs from South Africa and India; marble from Brazil and Italy; wooden doors from Dubai and chandeliers from the UK. Approximately 1,790 square meters (19,270 square feet) of 24-carat gold leaf was used to embellish the interior. 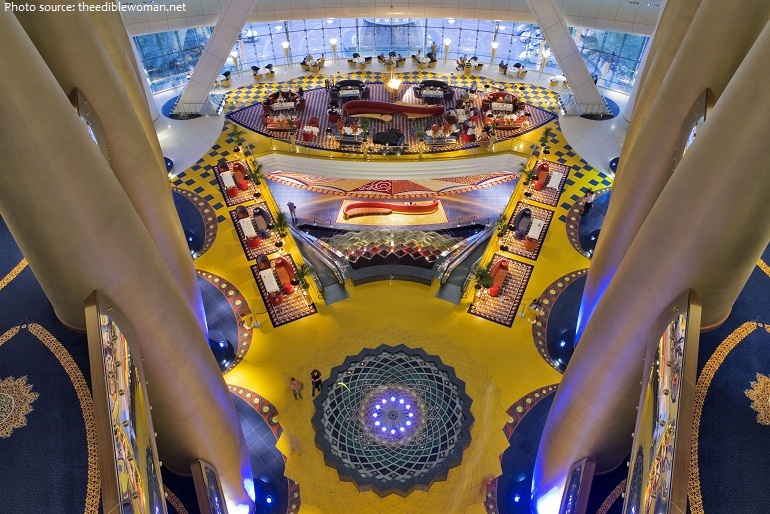 Despite its size, Burj Al Arab holds only 28 double-story floors which accommodate 202 bedroom suites. The smallest suite occupies an area of 169 square meters (1,820 square feet), the largest covers 780 square meters (8,400 square feet). There are 142 One Bedroom Deluxe Suites, 28 Two Bedroom Deluxe Suites, 18 Panoramic Suites, 4 Club Suites, 6 Diplomatic Suites, 2 Presidential Suites and 2 Royal Suites. It is one of the most expensive hotels in the world to stay in. The cost of staying in a suite begins at $1,000 per night and increases to over $15,000 per night; the Royal Suite is the most expensive, at $24,000 per night. 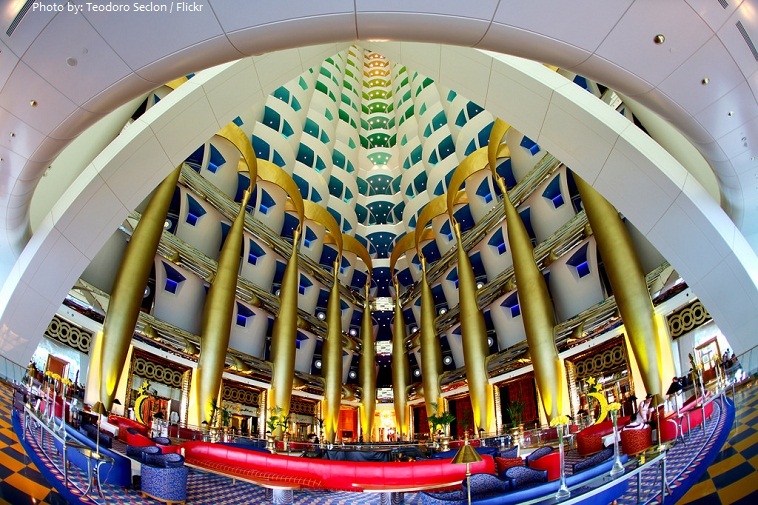 The Burj Al Arab’s atrium is the world’s tallest, measuring 180 meters (600 feet) high. Atrium is abundant in warm, natural light, flanked by golden columns, with a beautiful central fountain where water arches dance in sudden bursts over 42 meters into the air. 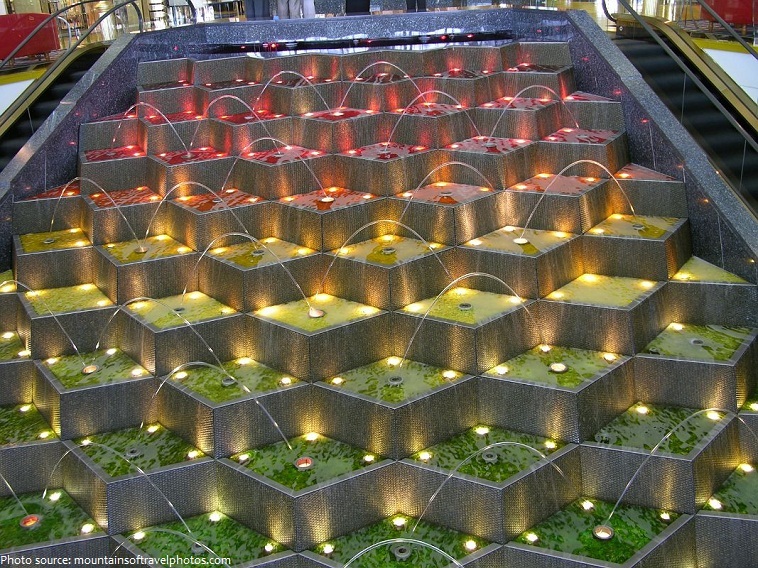 The Cascade Waterfall at Burj Al Arab combines finely atomised water with fibre optics to produce a unique kaleidoscope effect. As water and fog flow downward through the glass and stone-filled steps, water arches elegantly in a choreographed movement. 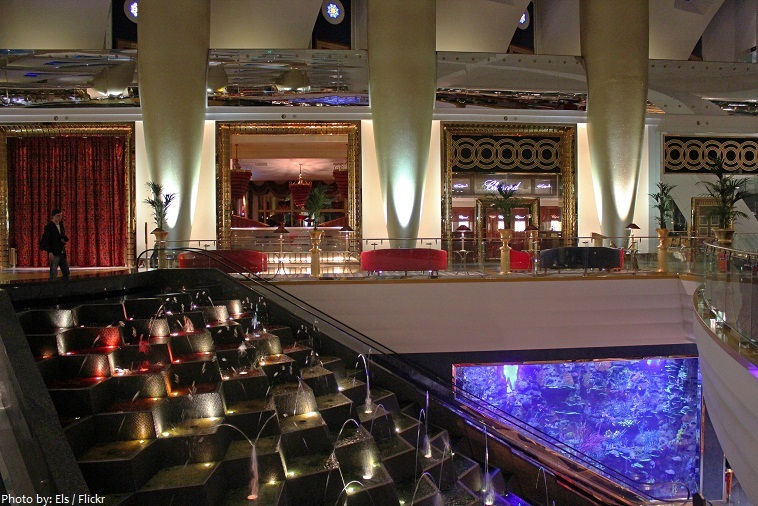 There are three aquariums in Burj Al Arab hotel, two situated on each side of the main hotel lobby and the circular tank in Al Mahara restaurant, with approximately 50 species of fish kept in the tanks. There are 29,000 Swarovski crystals in the ceiling of Junsui Lounge, designed in the shape of the Milky Way. Restaurant Al Muntaha (“The Ultimate”), is located 200 meters (660 feet) above the Persian Gulf, offering a view of Dubai. It is supported by a full cantilever that extends 27 meters (89 feet) from either side of the mast, and is accessed by a panoramic elevator. 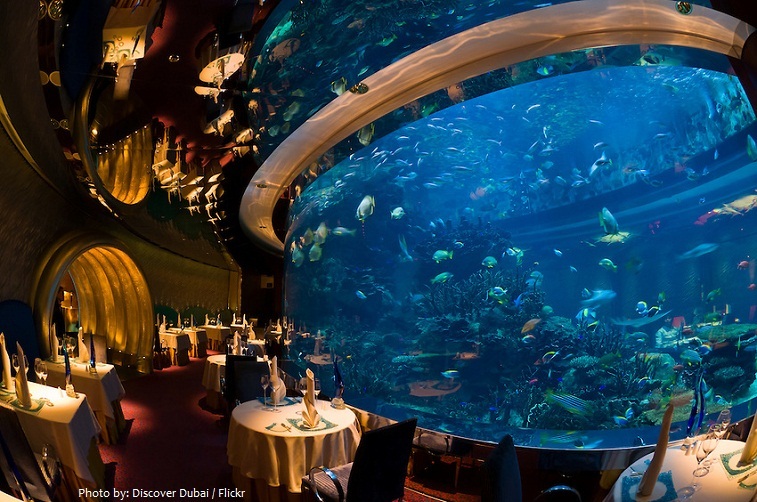 Restaurant Al Mahara (“Oyster”), which is accessed via a simulated submarine voyage, features a large seawater aquarium, holding roughly 990,000 liters (260,000 US gal) of water. The female shark, which lives in a restaurant aquarium has experienced four straight years of “virgin births” — a feat never before documented among sharks, according to marine biologist David Robinson. Talise Spa won the “Best Luxury Hotel Spa” award in the “World Luxury Spa Awards Global Winners” category for the second year running in 2014. It has a helipad near the roof at a height of 210 meters (689 feet) above ground. There are 60 reception desks, one per each floor. The staff to suite ratio is 8:1. It is one of the highest in the world. Every female member of the front office and greeting desk Team wears bespoke, gold earrings and necklace pendants, in the shape of Burj Al Arab logo. One of the world’s largest fleets of Rolls Royce’s available for guests. Every guest get their own 24 carat gold iPad during their stay. It will take you 1080 steps to reach the 27th floor of the hotel. It takes one full month, 19 people, plus the rope access team to clean the windows of the whole building.